Goblins aren't really known for their long-term planning skills. They're very much more "in the moment" types. So, when a bunch of gold and jewels were found literally under their feet, they started digging mines. However, those mines aren't the safest place to be, and the ceiling is starting to crumble. It's a race to grab as much as you can before everything suddenly sees the light of day (for all the wrong reasons). That's what's going on in Off the Rails, a new board game that's up on Kickstarter now. 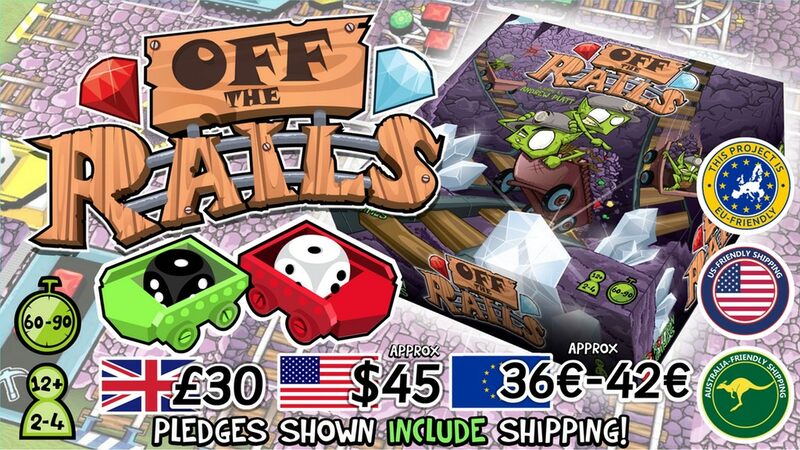 Off the Rails is a strategic, competitive, tile placement, roller-coaster of a board game for 2-4 players recommended for ages 12+. Players control a team of gem-hungry Goblins racing uncontrollable mine carts underground to retrieve the most jewels before the earth collapses into the deadly chasm below! Easy to pick up and play but with a compelling strategic puzzle for more hardened gamers to master, Off the Rails combines thoughtful tile placement and forward planning with cut-throat racing and out of control collisions! Culminating in the total destruction of the board, can you leave your opponents eating your gold-dust and escape the chasm with the most riches? The campaign is up and running now. It's set to go for another 24 days.